Citation Information: J Clin Invest. 2017;127(11):3987-4000. https://doi.org/10.1172/JCI89893. Mast cell deficiency prevented in the development of retinal neovascularization in an OIR mouse model. 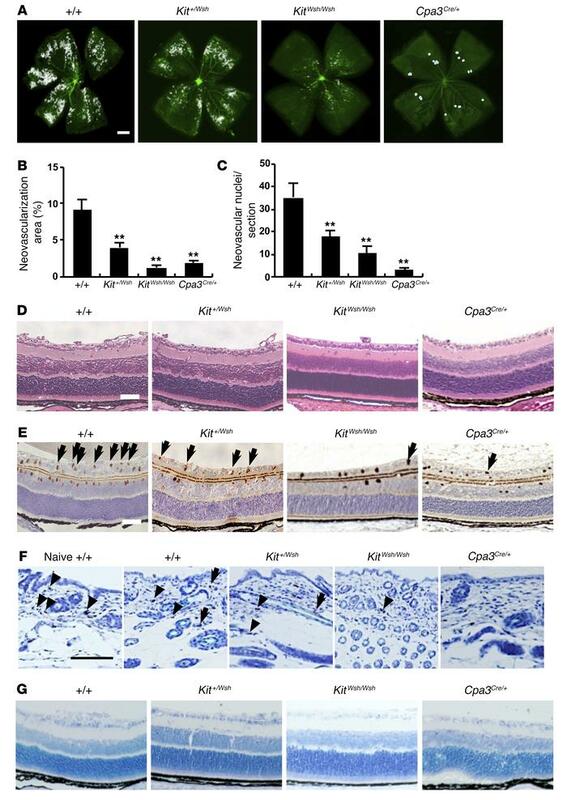 (A and B) Whole-mounted retinas revealed that pathological neovascularization, shown as tufts (white areas), was induced in mast cell–sufficient WT mice, but not in mast cell–deficient mice on P17. n = 8 in each group. **P < 0.01 versus WT mice, Dunnett’s test. (C) Retinal neovascularization on P17 was quantified by counting the number of neovascular cell nuclei at the retinal inner surface of eye sections after H&E staining. The number of neovascular nuclei was lower in Kit+/Wsh, KitWsh/Wsh, and Cpa3Cre/+ mice than in WT mice. n = 8 in each group. **P < 0.01 versus WT mice, Dunnett’s test. (D–G) Cross-sectional analysis of retinas was performed by H&E (D), PECAM-1 (E), or toluidine blue (F) staining of formalin-fixed paraffin-embedded sections. Results are representative of 3 independent experiments. (E) Arrows indicate endothelial cells that have penetrated into the vitreous space. Toluidine blue staining showed mast cells in the dorsal skin (F) of WT and Kit+/Wsh mice, but not in the retina (G). Arrows and arrowheads indicate degranulated and nondegranulated mast cells, respectively (F). Scale bars: 500 μm (A); 100 μm (D–G). Results are shown as mean ± SEM of values determined from 3 independent experiments (B and C).